THE Financial Intelligence Unit and the Central of Bank of Eswatini (CBE) are tightening loose screws towards complying with international standards. 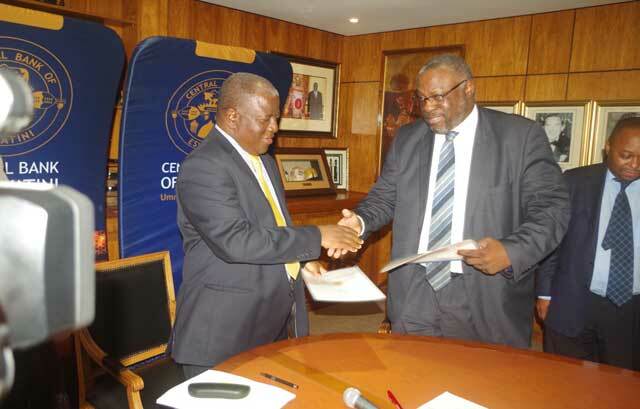 This was stated out by CBE Governor Majozi Sithole in a Memorandum of Understanding (MoU) signing ceremony between the two institutions on Monday. Sithole said CBE identified compliance with international standards as one of the major outputs of the 2018-2021 strategic objectives. In this regard, compliance with recommendation two of the Financial Action National Task Force was one of the identified areas in which such compliance needed to be achieved. Sithole said: “It is in compliance with these international standard requirements that the Central Bank of Eswatini and the Financial Intelligence Unit have taken the initiative to draw up a formal Memorandum of Understanding outlining specific areas of cooperation and coordination,” he said. According to Sithole, the international standard requirement emphasises the need for national cooperation and coordination. It stipulates that, ‘Countries should ensure that policy-makers, the Financial Intelligence Unit (FIU), law enforcement authorities, supervisors and other relevant competent authorities at the policymaking and operational levels, have effective mechanisms in place which enable them to cooperate, and, where appropriate, coordinate domestically with each other concerning the development and implementation of policies and activities to combat money laundering, terrorist financing and the financing of proliferation of weapons of mass destruction’. The MoU signing, according to Sithole, is a fundamental milestone in the achievement of technical compliance in preparation for the mutual evaluation exercise which Eswatini would undergo in the year 2020. “The crucial test of effectiveness will of course be demonstrated in the actual implementation of the MoU which should see both institutions working together to ensure the compliance with the Anti-Money Laundering and Countering Financing of Terrorism (AML/CFT) standards by financial institutions, mobile money operators as well as remittance agencies, all of which are supervised by the Central Bank for anti-money laundering and counter financing of terrorism purposes,” he said. Sithole said this would translate to benefitting the country at large with both institutions being members of the National Task Force on AML/CFT chaired by the ministry of finance. “Having mentioned that the two institutions have already been working together, I have no doubt that we will be well positioned to pass the effectiveness test,” he said.